It was my husband’s Grandpa Folkert’s birthday today. If he would have lived a few more years, he would have been 103. Grandpa Julius was always a jolly hard-working man. He knew the secret of contentment. He lived to be 98 1/2 years young, and had his mind intact until the last day of his life. Thinking about his birthday, I dug up a cassette tape we have of him. It was recorded in 2001 when my son Andrew needed an interview with someone elderly in the community. Grandpa must have been only about 88 then. Andrew was taking a “Hamilton History” class in Junior High. Of course I was more excited about it than he was, and we marched right over to Grandpa Julius. He knew more about Hamilton, our families, and the community than anyone we knew. I think he knew every road in three counties. He was born and raised in the house he still lived in until the last couple years of his life. He got married and raised his five children in that same house until his late 90’s. He was such an interesting man and I sure wish we had more of his stories now. My sisters and I went to pick peaches and apples the other day, and we remarked on the way home, how much Julius would know about our family. You see, my family and my husband’s families were connected in many ways. He was my dad’s cousin and he and Julia were neighbors across the country street their whole lives. Yes, I married a third cousin. But that’s a whole other story. Grandpa Folkert loved talking and laughing with people in his Dutch brawl. You would always be welcome any afternoon to sit at his kitchen table at 3 p.m. for cookies and coffee. Especially on Saturdays. Even when he spent a little time in Assisted living, no matter how long it had been since you had seen him last he was always welcoming. Never a hint of shame if it had been a long time. He always encouraged you to have a seat and chat. 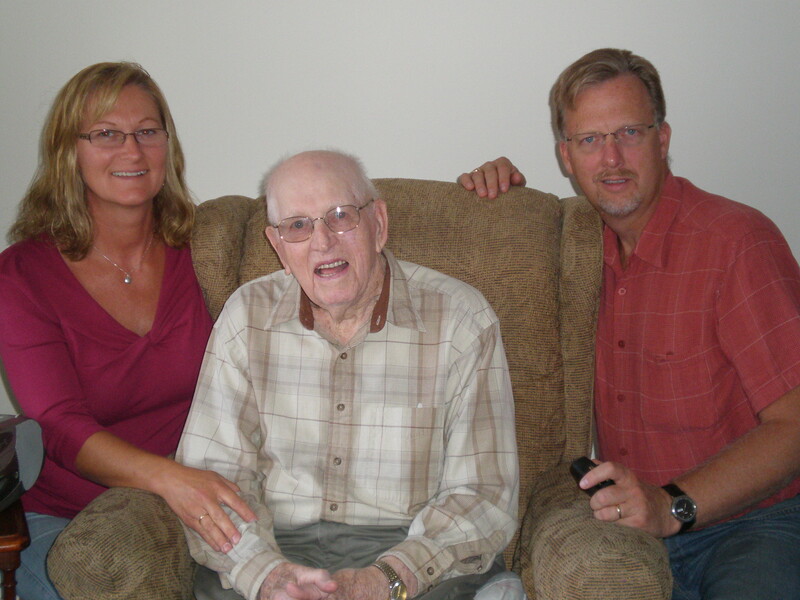 My husband and I with his Grandpa Folkert in 2010, when he was 98. When Andrew and I interviewed him, he said he was a “1912 model” when asked when he was born. We went on to have the most delightful interview talking about his growing up years, his schooling, his vehicles, etc. He talked about going to church in Hamilton with the buggy in the summer, and the sleigh was attached in the winter. So many stories told at one time or another. But so many stories lost too. If I could, I would share the interview, to encourage people to make sure you appreciate your elders while you have them, and listen. Ask them questions. Ask them if you can record them. You think you will remember their voice but you won’t. It was also sweet to listen to that tape again after many years, because my son Andrew’s voice was so cute and young. 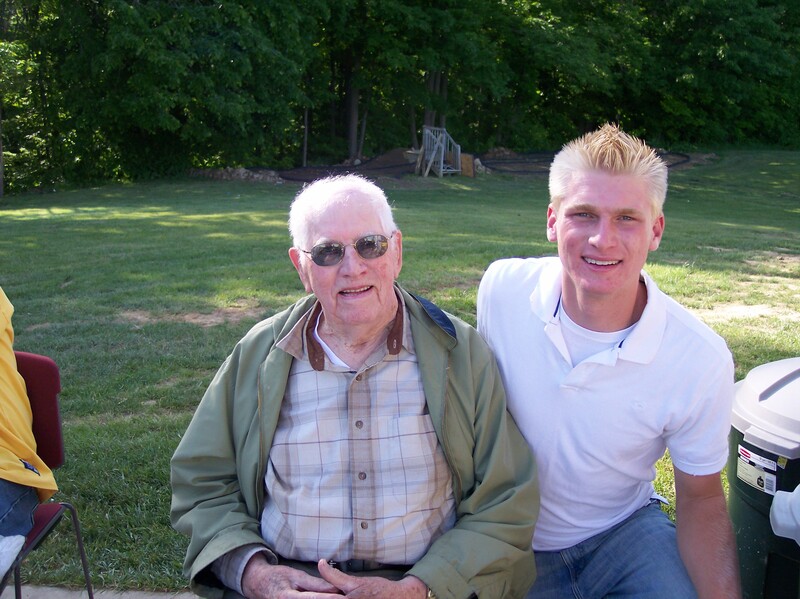 Andrew and his Great Grandpa Folkert at his high school graduation open house. Grandpa must have been almost 94. When I got home from the orchard with my sisters yesterday, I posted some pictures on facebook. Grandpa’s grandson on the other side of the family began sharing memories of him and driving the country roads with him. His daughters all chimed in about some of their memories and one thing led to another. They even talked about how Grandma Julia was best friends with my mom and how hard it was for her when she went to heaven. Our families were intertwined in many ways. They even had a water contraption under the road so that if one of them lost water, they could open the valve and help one another out. Grandpa Julius knew my Grandpa Gerrit. The story from one of my sisters is that one day he noticed the barn doors weren’t opened up at the normal time. It was the day my Grandpa K. got kicked in the head by a horse and they had gone to the hospital where he later died. Grandpa and Grandma Julius and Julia were a huge help to my dad, being a young man of 18 suddenly running a farm and taking care of his mother on his own. A day never went by without some of us waving to one another while on the road, mowing lawn, playing ball, swinging on that tree swing,https://myrnafolkert.wordpress.com/2014/10/06/if-a-tree-could-talk-the-stories-it-could-tell-part-2/ buying eggs, or just visiting. The country way of growing up really formed me in solid ways. Grandpa Julius outlived both of my parents even though he was 8 years older. He was the glue that seemed to hold the whole neighborhood together and it has never been the same since he left. He knew everyone it seemed. When I was young, I didn’t appreciate the history and wisdom. Now I do. His way of living is an excellent model for us. Live with integrity and solid faith. Care about people. Live Real Life. Laugh. This entry was posted in ancestors, Ancestry, faithful members of our community, Family, integrity, listen, Memories and tagged ancestors, ancestry, faithful members of our community, family, integrity, listen, memories. Bookmark the permalink. You “nailed it!” Thanks for the memories. Thanks for commenting Dottie! I’ve been thinking about him all week and the Facebook conversation inspired me. He was a special man. Thanks Duane! Yes we were blessed to have him as a grandfather, father, neighbor and friend. A big plus for the whole Hamilton community. I agree! When I moved to Jamestown there was a wonderful older woman named Ruth VanNoord who just welcomed me into her heart and home often for a cup of tea, a cookie and always to share the history of Jamestown. I loved hearing stories of her childhood, the buggy to get to school, or the sleigh depending on the season. Once heard a person say, “Old people don’t like change.” I had to laugh out loud! Like it or not, she had surely lived through a LOT of change! Sometimes we forget how much change has happened in their lifetime! Thank you for this trip down memory lane. It has brought a smile to my face. That’s for sure Kelly! We asked him about that, I mean they went from outhouses to the Internet. Amazing amount of changes in our grandpa’s lifetime and he just rolled with it. Blessing to have those memories to cherish. Thank you, Myrna! You can see the caring which goes to the following generations. Thanks Betty! Yes, it was a fun time interviewing grandpa-he always thought so much of all the grandkids and my boys. At one point I asked him “what did you do that was naughty?” He said he better not give Andrew any bad ideas and laughed his jolly laugh! What a nice piece about Julius, Myrna. I remember him well, having grown up in the neighborhood. I remember you, too, when you were a baby; I babysat you and Audrey a couple of times. The last time I saw Julius he was 95, I think. We had taken my mom to Russ’ for supper and he was there. He and mom were cousins as well as longtime neighbors and so we stopped to chat for a few minutes. He was always so ready to stop and talk — and laugh. He had a great laugh! Yes, Ethel Haan was my mom. Her maiden name was Folkert. She went to Overisel church all her life. Hi Sandy, I didn’t realize that your mom was a Folkert, but we knew her for years at ORC too. She was a sweet lady, always so friendly. I want to say she got close to 100? My sister Eloise knew you, and said that your sister Eleanor was about her age.